Moxie or Intimidate for Krokorok? in-game Pokemon for competitive battles. Well, Moxie increases the user's Attack one stage upon fainting an opponent, whereas Intimidate lower's the Attack of all opponents by one stage when the ability-bearer switches in. Also, when a Pokémon with Intimidate is your Lead Pokémon in your party, wild Pokémon are 50% less likely to be lower level. If you are going for Moxie, keep in mind that Krokorok's Attack stat is 82. When it knocks out an opponent, it's Attack stat will be 1.5x the original amount. But, if you are leaning towards Intimidate, your opponent's Attack stat will be 0.66x the original amount. 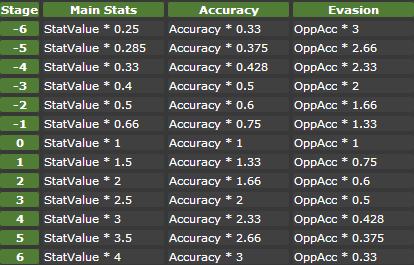 a picture of the stat modifiers chart is found here. Also, I do not know how it competitive play works, but I do know how these Abilities work. As you said, both are pretty good abilities. But, I'd go with Intimidate because Krokorok's Defense stats are 45 for Special and Physical. The real reason why intimidate is better is because Krookodile works best when it switches in on a weakened Pokemon, one-shots it, and switches back out. Moxie boosts would obviously be lost in the process. By the way, don't use Krookodile in competitive when Landorus is so much better. Arbok: Shed Skin or Intimidate for a Coil sweeper set? Shed Skin or Moxie for Scrafty? Intimidate or Moxie for Salamence? Would the Moxie ability be more effective on Salamence, or Intimidate? Intimidate or Rivalry for Luxray? Iron Fist or No Guard for my Golurk?